We won’t lie … this lasagna is a bit fussy. But the extra time it takes to prep this dish is well worth the effort. 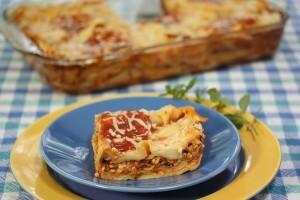 As lasagnas go, this one has super, duper kid appeal. It’s also filled with good-for-you veggies (cut up small, we might add) and is considerably lighter in fat and calories than the vast majority of other lasagnas out there. SPECIAL OFFER: SchoolFamily.com readers can purchase No Whine With Dinner at 30 percent off the list price, and get free shipping, by ordering the book here and using this promo code: FS2011. Heat 1 tablespoon of the oil in a large Dutch oven or saucepan over medium heat. Add the onion and cook, stirring frequently, until softened, about 7 minutes. Add the garlic and cook an additional 1 minute. Raise the heat to medium-high, stir in the mushrooms, zucchini, carrot, and salt and pepper to taste and cook, stirring frequently, until the vegetables are softened, about 8 minutes. Add the turkey and thyme and cook, breaking up the large pieces, until no longer pink, about 5 minutes. Season again with salt and pepper to taste. Stir in the pasta sauce, heat through, and set aside. Heat the remaining oil in a medium saucepan over medium heat. Add the flour and whisk until smooth, about 2 minutes. Whisk the milk and nutmeg slowly into the flour mixture. Raise the heat and bring to a low boil, stirring constantly. Reduce the heat and continue to simmer and stir gently until the mixture thickens, about 3 minutes. To assemble, lightly oil or coat a 9 x 13-inch baking pan or dish with nonstick cooking spray. Spread 1 cup meat mixture on the bottom of the pan. Lay five lasagna noodles on top, allowing them to overlap. Break the fifth noodle into a few pieces and fill in the empty spaces. Top evenly with 3/4 cup béchamel sauce, 1/4 cup Parmesan, 2 cups meat mixture, and 1/4 cup mozzarella cheese. Repeat with a second layer of noodles (use 6 noodles this time; 4 slightly overlapping and 2 broken), 3/4 cup béchamel sauce, 1/4 cup Parmesan, the remaining meat, and 1/4 cup mozzarella cheese. Top with the remaining noodles (break up the 5th one again), béchamel sauce and cheese. Cover loosely with foil and bake until bubbly, about 50 minutes. Remove the foil and bake until the cheese melts, an additional 5 minutes. Let stand about 10 minutes before slicing and serving.